I have sad news on this Sunday morning. 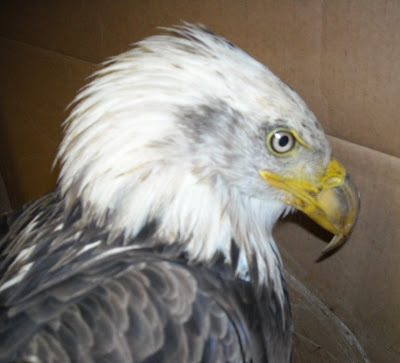 The adult Bald Eagle that was admitted on August 21, 2009 died this morning. She was with us for a day short of a month. 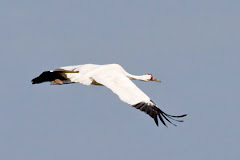 For those of you new to this blog you can get her entire story by going back to the August 21st blog and later updates. We knew if was a long shot for her to survive when she was admitted with such high blood lead levels. We are however committed to giving each of our patients our best and that is what we did with this eagle. I feel as long as they are fighting and show the spirit to live we are willing to do what it takes to help them in that effort. As you read this you can understand why releases are so special to us. Had she lived, the Post Lake Bald Eagle would have had a joyous release. No one here would have been sad in the slightest to see her spread those huge wings to the world again. It would have been a celebration. I am asked so many times if I am "sad" to release the birds we rehabilitate. The answer is a resounding NO WAY! The only reason we do this work is not to have wild "pets", but to get the birds back out where they belong. We work hard to give them a second chance at life, not to keep them with us. In this case as in all cases of lead poisoning and some other toxins I feel a special responsibility to try hard to save the a patient. This is an entirely human caused event. It seems someone has to take the responsibility to correct it. Wildlife rehabilitators are those people for now. At least until we ban lead for hunting and fishing in this country as we have in paint and things that affect "US" directly. There is nothing "natural" about death by this toxin. 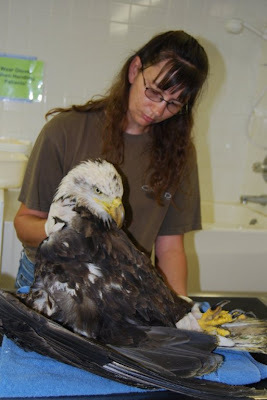 This was a huge female Bald Eagle that was meant to be a survivor in her world. In the wild at least 60% of raptors die their first year of life. Only the best of the best make it to adulthood and she was there. Her sin was eating a fish that had a lead sinker in it or eating from a carcass that had been shot with lead ammo. She could not have known. Wildlife rehabilitation is a roller-coater ride. There are times when we get easy cases that require only a short period until they are back in the sky again. We love those cases. Then, there are times like with this eagle that we put a huge amount of time, money and emotion into the bird, and in the end, they die. We hate that. I wish there was an easy way. We could euthanize all birds that are critically ill and not put staff through that awful ride. I think I speak for all of us here at REGI when I say, that is not acceptable unless the bird is in terrible pain or discomfort and has lost the will to live. We have to look in the mirror each morning and know we have no regrets and have done our very best for all the birds in our care. The worst news is we will not have to wait long before another and then another case of lead poisoning is admitted. With our fall hunting season looming our December and winter months will be especially busy in this regard. I hope her story inspires some of our blog readers to think about the wildlife when it comes to human caused events including but not exclusively lead poisoning. You are somebody and you can make a difference for them. There is so much we can do but don't because it seems like a tiny thing. 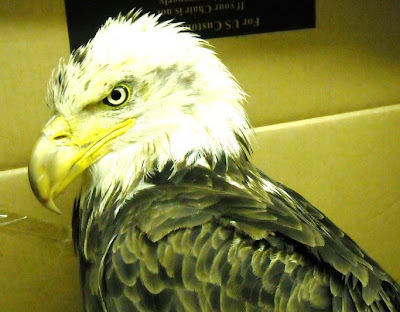 One person NOT using a lead sinker would have made a difference for this eagle. We have lots of cases in, and about 100 patients that need my concentration. It will be a busy day. Being able to write my frustration helps.